Being a mom is the most amazing honor. I love my mom and am lucky to be a mom to two wonderful children, a job that I wouldn't trade for anything on earth! In celebration of Mother’s Day, Procter & Gamble® has teamed up with Dollar General to honor moms, Every Day Heroes who sacrifice for their families and still find time to make a difference in their communities. Using the theme “Moms Rule,” the Dollar General “Every Day Heroes®” campaign will also honor moms by offering great savings for the heroes closest to our hearts. 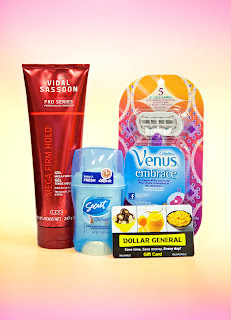 In exchange for sharing the "Moms Rule" promotion, I received a great prize pack that included a Venus Embrace razor, Secret Outlast deodorant, Vidal Sassoon gel and a Dollar General gift card. To celebrate and honor moms, Dollar General chose Maria Segura as its Every Day Hero for May 2013. Maria exemplifies the Dollar General Every Day Hero through her commitment to build a better life for her family through literacy and education. Maria was a migrant worker and through The Family Literacy Academy of Immokalee in Florida, she earned her GED and was able to offer her two younger children a better future. Today, Maria is the heart and soul of the program and donates much of her time to visiting families and assisting them with any needs they may have. Be sure to pick up the May P&G brandSAVER® in your local paper this Sunday, April 28. Also, be sure to visit the Dollar General Facebook page in May and create a custom “Moms Rule” photo for your own Facebook Cover. This giveaway will end May 17th at Midnight EST. Disclaimer: I received a complimentary prize pack from Procter & Gamble and Dollar General for the purpose of hosting a giveaway. Regardless, I only recommend products or services I use personally and/or believe will be a good fit for my readers. The views and opinions expressed on this blog are purely my own. Results may vary. No monetary compensation was received. my mom passed last year, but wonderful things about moms is that the fact they can multi-task. I love being a mom because of all the hugs! Because I created something so beautiful! Tell me why you love being a mom or the favorite thing about your mom! I love my mom is a great listener and very generous. I love how much trust my children have in me and how they don't see skin color. my favorite thing about my mom is she is fun and always there for me. I am not yet a mother, but I love that my mother always put us first. my favorite thing about being a mom is all the hugs and kisses! I love the Hugs and kisses from my sons! Feeling the pride when they do something good! My mom is so much fun! She also is really smart and gives great advice. I love my moms smile. I love the random hugs or I loves you's that the kids give me. They are amazing little people. I love being a mom because I get to experience the best form of love. My mom loved me no matter how rotten I was to her. My favorite thing about being a Mom is the unconditional love that I get from my kids, no matter how mad they get, I know they still love me very much! My favorite thing about my mom is that she always knows whats best for me. Being a mom is just so satisfying! I love being a mom, especially when my kids come to me when they are upset so they can talk. My favorite thihg about my mom is that she had a good sense of humor. I love being a Mom because everyday my daughter says something that makes me laugh and love life. I've been blessed with a wonderful Mom -- she's a wonderful role model and although wasn't able to finish school -- is the smartest lady I know! My mom always loves me unconditionally. I love my mom's laugh. =) It's so over the top and heartwarming. My favorite thing about my Mom is that she is always there for us! What I love about my mom is that she loves me unconditionally and is kind to everyone. 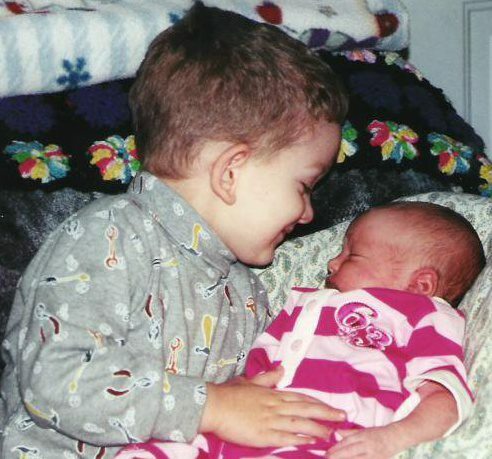 I love being a Mom as there is not another job that is so rewarding! I love being a mom because never in my life have I felt so loved, like my heart is whole now! I love being able to play games with my kids. I love how much my son loves me no matter what!! I love teaching my kids things in life. Being a Mom is the GREATEST job I will ever have in life. Favorite thing is when my toddler takes my twenty dollar anti wrinkle cream and puts it on her horses hooves in her room....I can't punish her for taking care of her animals! I love that my mom is always there for me, and helps encourage me. Children Grow So Quickly - Then & Now Photos! Earning Money Online: How it Works for Me! Call Me Frugal... But Don't Call Me Cheap! mombo Nursing Pillow - Unique & Functional! Our Favorite Summer Activity: Outdoor Camping! Win a Summer Camp Experience at Adventure Treks! Blog Giveaways - Enter To Win!